It’s important to keep WordPress and your plugins up to date. Not only does give you the latest cool features, but you’ll also get the latest bug fixes and security patches to protect your site. First: if you have a testing site, absolutely update and test there first. In the best (and most likely) case, everything will go smoothly. In the worst (and very unlikely) case, your website will break. Updating is usually quick and uneventful, but very infrequently there can be problems. These are rarely problems with WordPress itself. Most often the problems happen because of a conflict with your theme or your plugins. You may want to apply any theme and plugin updates before updating WordPress, in case those updates are meant to avoid this sort of conflict. The following process will make problems less likely. The following process will make problems less likely when you update your plugins. Choose a time when you can afford for the site to be temporarily inaccessible. Update the plugin(s), either individually at Plugins, or as a group at Dashboard > Updates. Consider putting the site into maintenance mode with a plugin like Coming Soon Page or Ultimate Maintenance Mode. Logged-in users will still see the site as usual, but visitors will just get notified that the site is temporarily unavailable. Disable all the plugins that need updates. Update and enable the plugins one-by-one, testing the site after each. Understand that with some plugins disabled, some features might be missing. If you enabled maintenance mode, disable it. 1. Ask a WordPress expert to do the update for you. 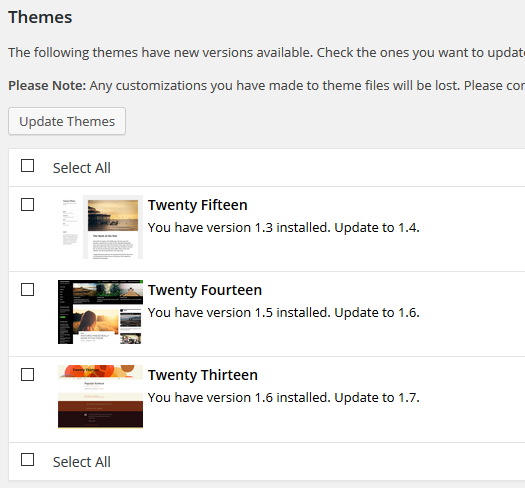 The theme update process is similar to the plugin update process, but with one additional step. Check Appearance > Themes and make sure you have at least one other theme installed. Typically this will be one of the WordPress default themes (Twenty Fourteen, Twenty Fifteen, etc.). If something goes wrong with your main theme update, you can switch to this other theme and limp along for troubleshooting. Update the theme, following the directions on the Updates screen. Clicking the version number will tell you more about the new WordPress update. If the update includes security patches, it’s especially important to apply the update soon. You update your WordPress software version from the Dashboard > Updates menu. Click Update Now in the WordPress Update notice and follow the instructions. Disable (don’t delete!) all active plugins in the Plugins menu. Test your site, understanding that without plugins some features might be missing. Re-enable the plugins that were previously enabled, testing the site after enabling each plugin. Ask a WordPress expert to do the update for you.